5.31 points at 13 votes (rank 743). The start of the game... and the unexpected early end thanks to the finicky controls. 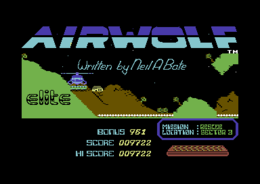 Airwolf is a skill game where you need to steer a helicopter through a labyrinth. Some hostile defensive units subtract life energy when being touched, others lead to instant death. The life energy or damage display are shown by medieval shields. The Airwolf helicopter has no stable flying height, but drops downwards if you do not use the joystick. The ammunition of the cannon is not limited. You only have one life. The position and the order of the five scientists change from game to game. Hawke is a former military pilot who was deployed in the Vietnam War and now he is the only man who is able to fly the billion dollar special helicopter, the Airwolf! You need to collect the five scientists and bring them back to the base, then the game is finished. 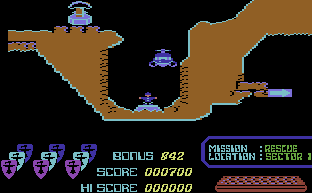 You steer the helicopter Airwolf through a coloured 2D cave labyrinth. 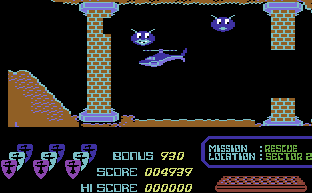 Airwolf, enemies and people to be rescued are animated. There are simple sound effects. 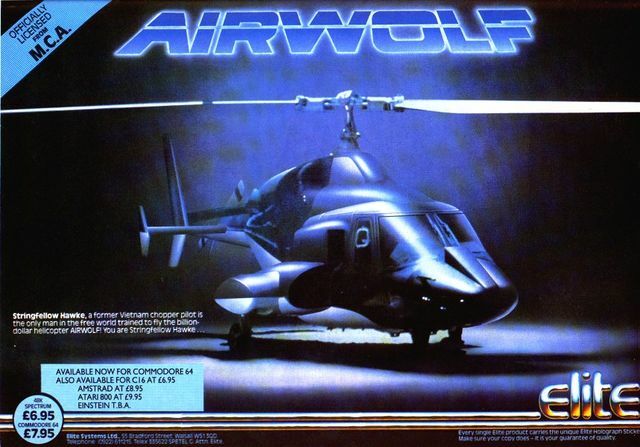 As background music you can hear the theme of the Airwolf series. The sound programmer Mark Cooksey provides his first professional work here. 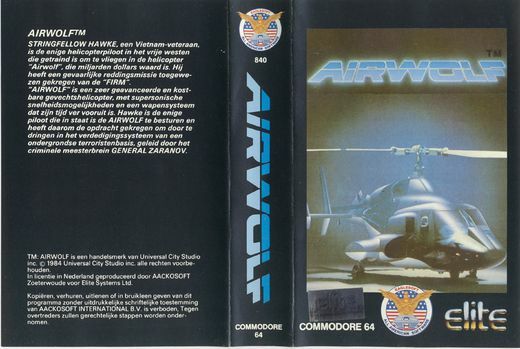 The Airwolf helicopter has in this game a kind of protective shield. In a collision the helicopter takes some damage until the total shield's energy is used up. If this happens, the Airwolf is destroyed. The shield energy is fittingly displayed by medieval shields. But beware! There are enemies that cause so much damage that one single collision leads to the total destruction of the helicopter despite a full shield. A map from the game made out of C64 screenshots. The game has to be loaded first, then you need to enter the poke and restart. Shmendric: "There are points off for the flabby controls (at least with VICE and keyboard), unfair situations and an extremely unnerving music. Instead of motivation, the game created rather frustration in me, I did not even want to play a reasonably presentable highscore. My reminiscence of the game was negative and this has not really improved during the creation of this article. The music reminds my strongly of a cassette in a recorder where the batteries are running low. And I was also not a fan of the series, this would probalby have given a bonus. I have only given 3 points here." Flodder: "Well, I do not remember this game being thaat bad. Especially the graphics were rather nice to look at. For the sound there is the Mute key on the TV remote control. I liked to play it at that time, but I was also a big fan of this series (let me, this was the 80s). Just enough for 5/10." Robotron2084: "I would say: This is one of those games that could have made it big. If the programmer only had invested the 1a scrolling and the nice graphics into a quasi follower of Fort Apocalypse and not into a game, where the player's biggest enemies are the hypersensitive controls. 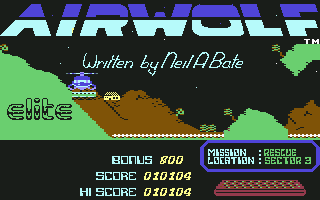 This would have been much better than this technically refined but eventually frustrating small game. Sure... would have, could have, should have. 6 out of 10 points." TheRyk: "For exploring caves there are more adequate vehicles than a huge helicopter. Everyone had this game and most people liked it in a way, but next to no one could play it really well. Back then I found it kind of fascinating, maybe just because I knew and liked the TV series and recognized the title music, maybe because flying through the caves was really fascinating once you figured out how to leave the starting room. However, I never got really far due to the game being too fiddly, comparable to Killerwatt and its clones, the shield system not really making it much easier, since some of the enemies kill you at first collision, anyway. I think, music and graphics are pretty well-done for 1985, but all in all, the game is too frustrating till the first successful rescue to rate it any higher than 5, nostalgia bonus already included." ThunderBlade: "For me as a fan of the TV series this is of course a must have and of course extremely disappointing. 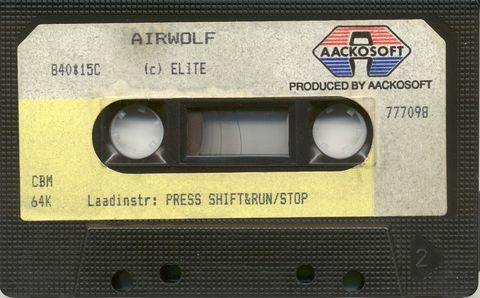 Technically well done for the year of release, but the loveless conversion of the title music announces it: No, this is not a game where you can experience the Airwolf flair very closely! 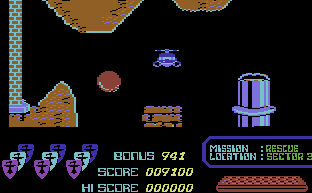 The author has probably never seen the series, at the most the cover of the game, because obviously the helicopter is blue there, therefore it gets this colour in the game. 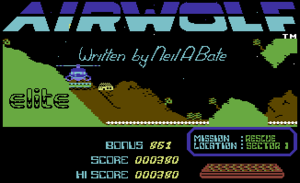 Some kind of wannabe Fort Apocalypse, in which Airwolf flies around in a cave system... ouch. Instead of several weapon and spy systems it has suddenly shields like the Enterprise. To complete the fiasco, the difficulty grade is also much too high. I can only give benevolently 4 out of 10." 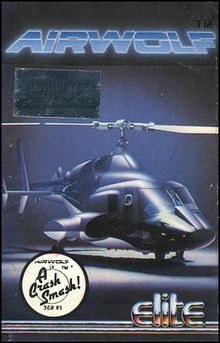 Airwolf is the movie realisation of the TV series with the same name, which was successfully produced from 1984 to 1986. In the centre of the plot is Stringfellow „Huckleberry“ Hawke, played by Jan Michael Vincent, who is a former Vietnam fighter pilot. With the special supersonic speed helicopter Airwolf, he flies secret missions and also solves private problems. A Bell-222 helicopter was optically modified for the series. This page was last modified on 14 February 2019, at 14:28.